BRIGHTON Dome. April 6 1974. The conductor strides to the podium to face the orchestra. He is dressed as Napoleon! All those crammed in the auditorium and millions of television viewers across Europe look on in puzzlement. Drums sound. Guitars thrum. Two glamorous young women stride to the front of the stage. The next three minutes of that glitzy and stomping performance at the Eurovision Song Contest launched Abba on to the international stage. They would become one of the most successful bands of all time, selling more than 380 million albums and singles. But it would be wrong to think that such stardom had come easily to Abba. In fact the road to Eurovision had been long and frustrating. 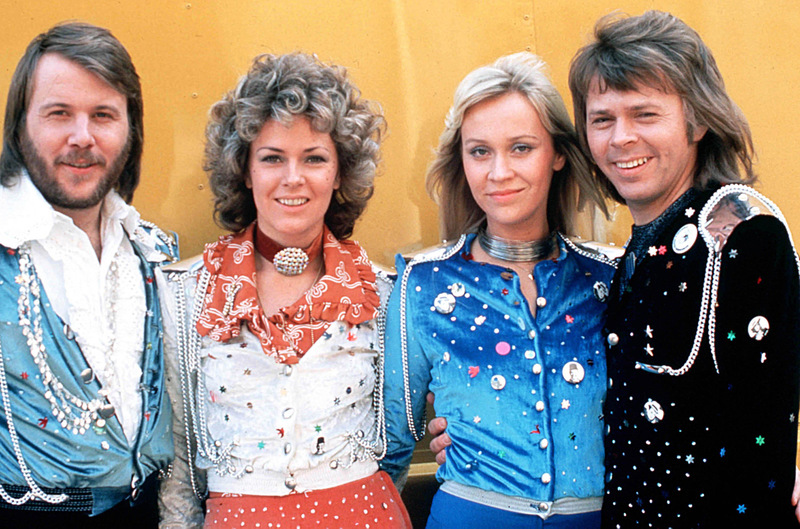 Agnetha, Björn, Benny and Anni-Frid were seasoned performers in Sweden long before they met. Bearded Benny Andersson was perhaps the best known. From the age of 18 he had been keyboard player and lyricist with pop group The Hep Stars. Known as the Swedish Beatles, their successes included three No 1 hits in their home country in 1966 alone. Björn Ulvaeus fronted the Hootenanny Singers, who were more of a folk and skiffle group. Their manager was Stig Anderson who would play a vital role in the future of Abba. Björn and Benny met on the music circuit and they quickly became friends. They started writing songs and eventually making records together while still having independent careers. It was 1968 when Agnetha Fältskog first met Björn when they were both guests on a TV show. Agnetha, with her golden hair, already had several hit singles and an album behind her. She had been singing with a dance band when she had been “discovered” by a music producer when she was only 17. She was offered a recording contract and her first single, a composition of her own called I Was So In Love, was a Swedish Top 10 hit. With their shared musical talent and a lot of personal chemistry Björn and Agnetha quickly became a couple. Love also blossomed for Benny and it was all down to Eurovision. He had entered the song Hey, Clown into the 1969 Melodifestivalen. This is Sweden’s version of our Eurovision: You Decide, in which a song is chosen to represent the nation. Benny didn’t win. Nor did fellow contestant Anni-Frid Lyngstad. But they did meet. Frida, as she is more commonly known, is from Norway, not Sweden and her childhood had been blighted by history. Born in 1945, she was the daughter of a single mother and her father had been a German soldier. Anti-German feeling was intense and often violent after the occupation of Norway in the Second World War. Frida’s mother moved them to Sweden to escape it. Tragically she died at the age of just 21 from kidney failure and Frida was brought up by her grandmother. Frida loved to sing and in 1962 even had her own band, The Anni-Frid Four. In 1967, as a soloist she won a national talent contest that landed her a recording contract with EMI Sweden. Records were released but major success proved elusive both in her career and personal life. Frida had married young and had two children. The marriage had failed, and dogged by depression she had given custody of the youngsters to their father. Benny too had two children from a previous relationship and they were being brought up by their mother. The Melodifestivalen offered both musicians hope of further professional recognition. However Anni-Frid’s entry came third; Benny’s lost out in a tie-breaker. The bigger prize by far for both was their meeting and falling in love. And they could always try for Eurovision another year, couldn’t they? In the following years, Benny became Frida’s producer and released several successful solo albums. Meanwhile Agnetha and Björn tied the knot and Agnetha also continued to tour. The two couples often worked together, though not at first as a band. They would write lyrics or one might sing backing vocals for another. In 1970 Benny and Björn released their first album as a duo. One track, Hey, Old Man, became the first to feature both Agnetha and Frida’s vocals. Released as a single it reached No 5 in the sales charts and was No 1 in the radio charts for 15 weeks! It wasn’t until 1972 that they got round to making a single together with equal billing. People Need Love was released under the long-winded name of Björn & Benny, Agnetha & Anni-Frid. Bbaa? A clunky name but a Top 20 hit. In the same year Björn and Benny made a joint attempt at Eurovision but wrote their song for someone else! Say It With A Song was sung by Lena Andersson at the Melodifestivalen but didn’t make it through. Ring Ring the following year met the same fate – despite being performed by Björn & Benny, Agnetha & Anni-Frid: Their first combined entry. It was also their first in English. The rules of Eurovision had changed, allowing contestants to sing in whatever language they chose. Björn and Benny had their hearts set on breaking into the British pop scene so this had seemed the obvious choice. The judges may not have liked Ring Ring but it became a huge hit, as did their album, not just in Sweden but Norway, West Germany, and the Netherlands. This anomaly was down to a system that put the festival voting entirely in the hands of a few judges. There was such an outcry over their wayward taste that the system was changed the following year, allowing the public more say. Perhaps the timing had been wrong anyway. Agnetha, now married to Björn, was heavily pregnant with their first child Julie. International fame could wait. The following year they were invited to enter again, but they would definitely need a better band name. Manager Stig often abbreviated their names into an acronym of their initials in his notes. Abba sounded good and as a palindrome looked good too, especially with a stylish reverse B in the middle. Then came the choice of song. They narrowed it down to either Waterloo or Hasta Mañana. No prizes for guessing which one Stig finally chose. Waterloo stormed through Melodifestivalen, winning by a huge margin. At last they were going to represent Sweden at Eurovision. The 1974 contest was held in Britain. This was only because the previous year’s winner, Luxembourg, declined to host what would have been their second show in consecutive years. There was potential for one country to take umbrage at their song: France. Dressing the conductor up as its defeated emperor wouldn’t have helped matters either. As it was, the French were not even there. They pulled out as a mark of respect for President Georges Pompidou who had died just days earlier. In their preparations for the contest, Stig and the band took full notice of the “vision” aspects of their entry. Glam rock was in full swing and Eurovision was not to be an exclusion zone. Bring on the knickerbockers with silver knee-high platform boots. And that was just Björn! He accessorised with a glitzy starburst guitar. Benny’s blue and white satin ensemble, with silver epaulettes, was an eye-catcher and Anni-Frid looked exotic in a swirling orange skirt. It was Agnetha’s electric blue, satin knickerbocker suit, with matching cap, that proved the iconic look though. The performance was faultless. 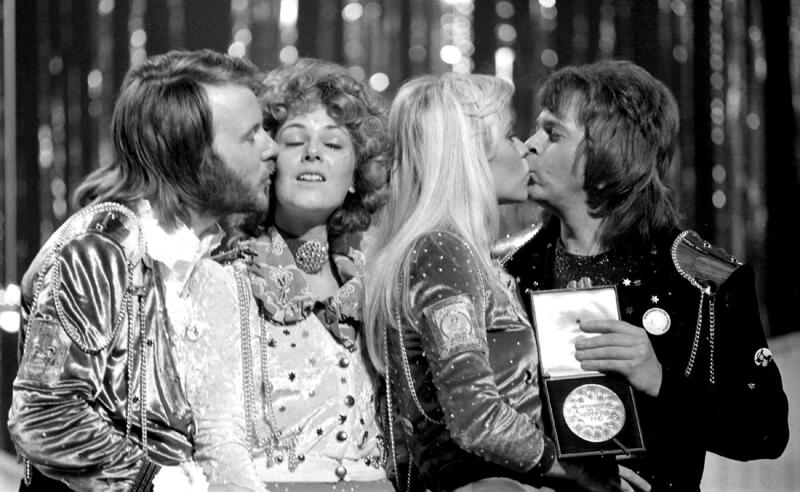 As the votes came in, Abba were clear leaders. 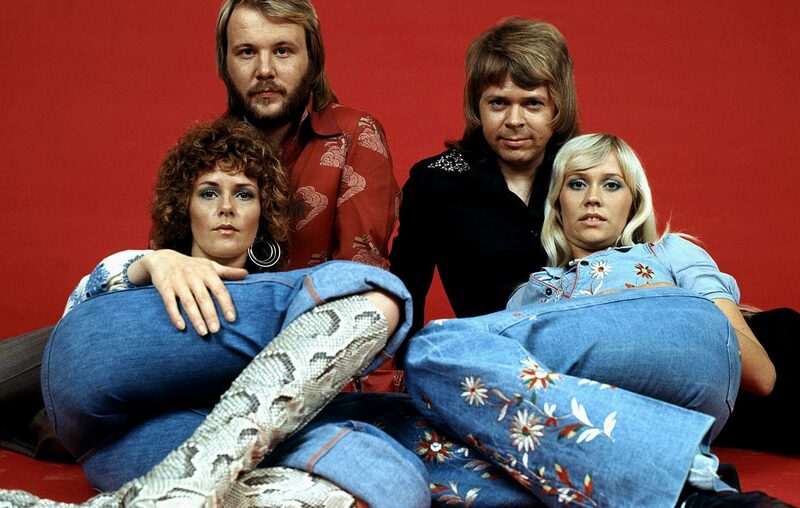 However the UK, the market Abba were so desperate to break, was unimpressed. We gave Abba nul points. They didn’t need us. Three results from the end, they were uncatchable. The auditorium rang out with applause as they reprised their winning entry. At last, Abba had made it. Or had they? As it turned out, they weren’t quite there yet.